Dieting is no fun and rarely brings lasting results. There must be a better way! Emerging companies think that hyper-personalized meal plans might just be the key to good health. Not everyone responds to foods the same way. Some people get jittery after drinking one cup of coffee; others can drink an entire pot right before bed. Some people are sensitive to gluten, while others can tear through an entire pizza buffet without a problem. As similar as humans are, we all have tiny genetic differences that can affect our digestion, absorption, and metabolism of individual nutrients. If you and your best friend follow the exact same diet but experience different results, blame it on your genes. But a solution may be at hand. The vast majority of diets don't work permanently, and weight lost is usually regained as the collective American waistline continues to expand. At the same time, the fit keep getting fitter as a segment of the population closely follows nutrition and supplementation guidelines to support their healthy lifestyles. And yet, members of both groups—the nutritionally "poor" and the nutritionally "rich"—are often confused about what, when, and how much to eat—and how to monitor it all to reach their goals. One conclusion that has been reached is that one-size-fits-all diets don't seem to work for most people. But science is catching up to the challenge, and new companies are responding with highly personalized nutrition planning. These companies are using DNA, blood tests, activity levels, and goals to craft individual meal plans and services that fly in the face of one-size-fits-all programs. "Personalized nutrition is absolutely the way of the future for health," says Cara Harbstreet, MS, RD, LD, of Street Smart Nutrition. "Knowing that your individual response to a food or nutrient may differ from someone else is motivation to take a proactive approach. People are more attuned than ever before to how they feel, and that the foods they eat have a direct impact on their overall sense of well-being. For athletes in particular, this hyper-personalized approach may give them that tiny advantage they need to take their performance to the next level." Meat and Potatoes or Smoke and Mirrors? The idea of using DNA to guide food choices still seems a little futuristic and confusing for most people, but Harbstreet insists it's legit. "Genetic code itself is not altered by diet or lifestyle, but the environment within a cell can influence how genes are expressed." For instance, she says, "there are known single nucleotide polymorphisms (SNPs) that impact nutrient utilization." According to Harbstreet, a mutation in one of these SNPs might indicate that an individual would benefit by taking B vitamins or making specific dietary changes. Companies leading the way into hyper-personalized diets insist that the time is ripe for these hyper-personalized foods to hit the mainstream. "The awareness of the importance of DNA has become widespread and reached critical mass," says Dr. Chandra Duggirala, MD, a metabolic and nutrition scientist, and the CEO of one such company, Fuel. "More and more correlations between nutrition and genetics are being discovered daily. We believe this trend will only continue to grow." Of course, it's still early for this dietary game changer, and there's a lot that remains unknown. Harbstreet points to cost as one barrier to entry. Genetic testing alone can cost several hundred dollars, not to mention the ongoing price of meal delivery and coaching. She also points out that in the hands of humans, even good data can become problematic. An over reliance on hyper-personalized foods could create a fixation on specific foods or nutrients, which could create gaps in other areas. Someone who realizes they metabolize fats differently based on genetics may go to extremes to make sure they get the perfect macronutrient intake, only to continue drinking sugary sodas and skimping on quality sleep. Her advice? If you have the money to spend and you're interested in seeing how your genetics measure up, go ahead and give hyper-personalized foods a try. Just don't forget to keep approaching your health from a holistic and integrative perspective. Habit provides a comprehensive solution for metabolic testing, nutritional planning, coaching, and meal delivery based on your specific profile and needs. It all starts when you buy the Nutrition Test Kit Bundle, which includes a proprietary shake, finger-prick blood tests, cheek-swab DNA tests, and detailed instructions to walk you through the testing process. Of course, your tests have to be sent back and analyzed. But once they are, you'll receive information on your ideal ratio of macros and details about your personal biology. Once you receive your results, you can opt to sign up for an ongoing meal-delivery service of any combination of breakfasts, lunches, and dinners, all fresh and delivered straight to your door. Where Habit is focused specifically on nutrition and personalized meals, DNAFit offers a somewhat more self-guided approach. You can choose the level of genetic testing and information you want to receive, including nutritional information, exercise information, or a combination of the two. The company sends you a DNA test kit, then you swab your cheek for DNA, seal it, and send it back. Ten days later you receive personalized reports designed to guide you to better fitness and dietary choices based on your genetic markers. FitnessGenes is very similar to DNAFit in terms of testing and results, but they have a greater focus on providing ongoing training and nutrition programs you can enroll in before or after receiving your genetic results. For instance, you can sign up for genetic testing alone, or you can sign up for genetic testing paired with a program to help you reach your nutrition goals. All plans are based on the information gleaned from your DNA test kit, including macronutrient and calorie breakdown for meals. That said, it's not a meal plan. You're in charge of using your results to guide your nutritional choices. 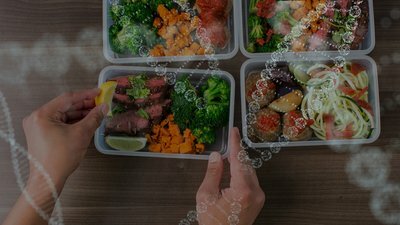 Fuel is a little different from the other companies on this list in that it's a personalized meal delivery service that uses your information to craft your individualized meal plan. But instead of providing DNA or blood testing itself, Fuel functions as a data aggregator and interpreter. The Fuel app enables you to input your height, weight, fitness goals, and activity level, and if you'd like, you can upload genetic and blood test results from any major company. You can also integrate Fuel with your fitness tracker or smartwatch. Based on the information you input, Fuel automatically personalizes your meal plan, adjusting each meal's macros and calories as your needs and activity levels change.